The rocks of the Canadian Shield cover up two-thirds of Ontario and contain many mineral deposits. Younger sedimentary rocks also have precious minerals and glacial deposits are another important source of mineral treasures. Ontario is the world's second largest manufacturer of nickel. The province is also an important producer of gold, copper, zinc. The sedimentary rocks of the south are also the site of Ontario's oil and gas industry. Since the Mixedwood Plains has a wet climate and plenty of precipitaion, the soil is mostly leached. 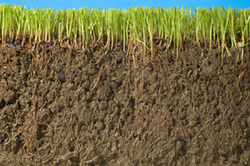 Leached soil means that the soil has been exposed to too much water and the nutrients have sunken deep into the ground so that the roots of the plant cannot reach them. At the same time, the mixedwood Plains has soil that is fertile and abundant for farming.